A common problem synchronization software has to handle is +-1 hour file time shifts after a Daylight Saving Time (DST) switch has occurred. This can be observed, for example, when a FAT32- or exFAT-formatted volume (in the following called "FAT") is compared against an NTFS volume, like when synchronizing a USB memory stick against a local disk. 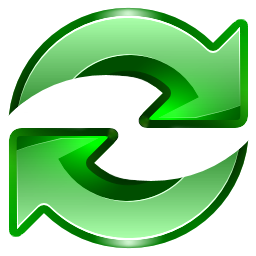 Files that previously appeared to be in sync are now shown with a one hour modification time offset, although they have not been modified by the user or the operating system. The reason for this behavior lies in the way NTFS and FAT store file times: NTFS stores time in UTC format, while FAT uses local time. When times of these two different formats are compared, one format has to be converted into the other first. In either way, Windows uses the current DST status as well as the current time zone for its calculations. Consequently, the result of this comparison is dependent from current system settings with the effect that file times that used to be the same show up as different after a DST switch or when the time zone has changed. 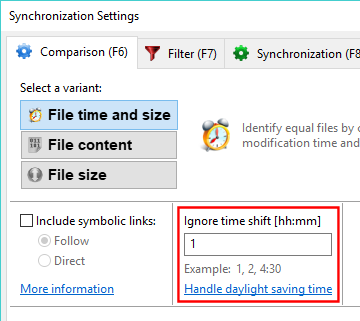 In FreeFileSync's comparison settings you can enter one or more time shifts to ignore during comparison: If you need to handle differences due to daylight saving time, enter a single one hour shift. If the differences are caused by changing the time zone, enter one or more time shifts as needed. File times have to be equal or differ by exactly the time shift entered to be considered the same. Therefore, the time shift setting should not be confused with a time interval or tolerance. Alternatively, you can avoid the problem in the first place by only synchronizing from FAT to FAT or NTFS to NTFS file systems. Since most local disks are formatted with NTFS and USB memory sticks with FAT, this situation could be handled by formatting the USB stick with NTFS as well.